I was introduced to breakfast bread bakes by my sister in law. One evening over the holidays, she surreptitiously whipped one together and stuck it in the fridge. Then one morning, when no one felt like cooking breakfast for a crowd, she stuck it in the oven. It tasted great, she made it look so easy, and (paired with a pitcher of spicy Bloody Marys) it totally sorted out everyone's hangovers. As if that's not enough, I love this recipe for a few more reasons. First of all, what's not to like about bread, cheese and eggs? Secondly, it really does taste better if you make it the day before, so it's the perfect dish for entertaining. And lastly, it's a breeze to customize the flavors depending on what you feel like, or what you have leftover in the fridge. In this rendition, I have gone for a fairly classic combination of leek, ham, and asparagus. But you could equally well use broccoli, bacon, red peppers, mushrooms, caramelized onions... Whatever tickles your fancy! Makes 4-6 portions. If you're feeding a crowd, you can simply use a larger casserole dish and double (or triple!) this recipe. Gently saute the leek in butter until it softens. Set aside. Briefly steam the asparagus so it's cooked but still crunchy. Set aside. Once it has cooled, roughly chop. Whisk together eggs, milk, and mustard. Generously grease your casserole dish with butter. I used an 8" square dish. Roughly tear the bread into 1" chunks so there is enough bread to loosely fill your casserole dish. I used around half a loaf of bread. 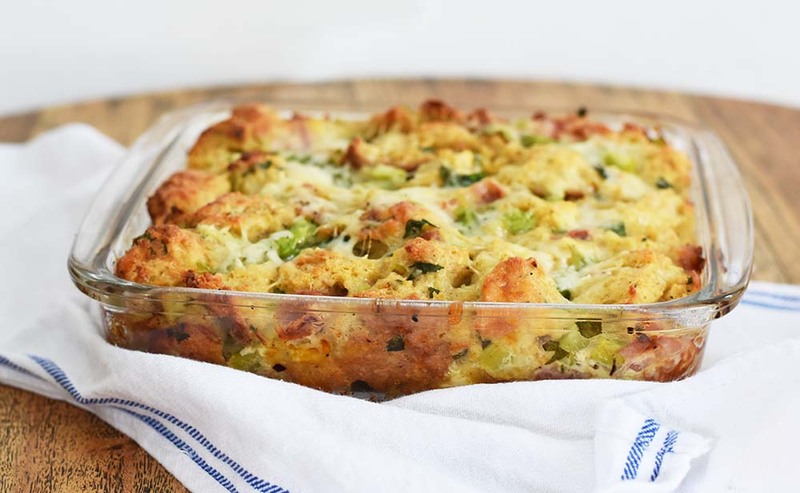 Sprinkle the leek, asparagus, ham, parsley and cheese over the bread in your casserole dish, and toss as required so there is a good mix of each ingredient throughout the dish. Pour the egg mixture evenly over the bread mixture. You don't need to do this step, but if you can: cover with cling film and refrigerate overnight. Bake in the oven for around 55 minutes at 350 degrees, until golden on top. As you will notice from my instructions, this recipe doesn't require precision. That's half the beauty of it. Every time I make it, I use a different combination of ingredients and it always turns out hearty and delicious. Have fun with it!